Yamaha R50 is the youngest member of R-series of race spec motorcycles from the Japanese manufacturer. Built with the purpose of serving those countries where you don't need a license to drive a machine under 50cc, this motorcycle carries a design that is similar to many last generation R series bikes. It carries the same twin headlight design as R125 or R15, further flaunting the same dimensions to attract buyers who are looking for a full sized bike. Yamaha currently has R50, R125, R15, R25, R3, R6 and R1 in its international lineup. Yamaha recently launched the much-awaited R15 Version 3.0 and R3 ABS @ Auto Expo 2018 for INR 1.25 Lakh and INR 3.48 Lakh respectively. R50 is powered by a 49.7cc, 2-stroke 1-cylinder engine producing 2.68 BHP and 3 Nm of torque. It weighs 128 kg and carries Golden alloy wheels for further visual appeal. The engine comes mated to a 6-speed gearbox while the front disc brakes measures 280 mm. 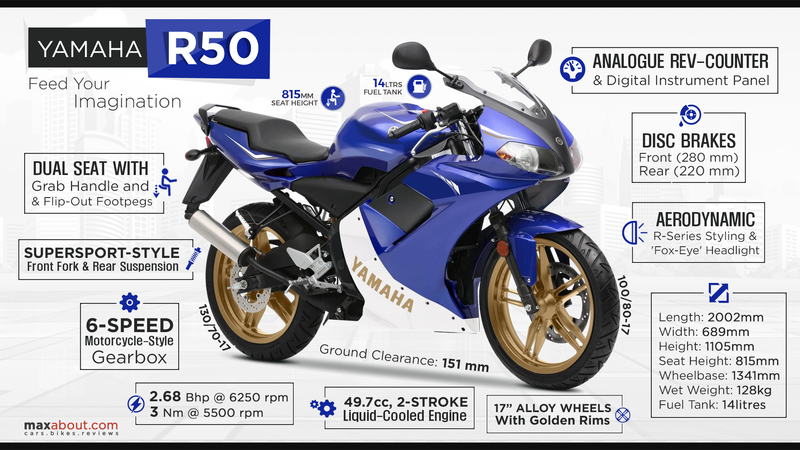 Click here to know more about Yamaha R50.